Germany: Hermann Goering is appointed Minister of Aviation. CBI - China: Day 117 of 142 of the 1st Battle of Hebei. Spain: Day 285 of 985 of the Spanish Civil War. Spain: Day 650 of 985 of the Spanish Civil War. CBI - China: Day 295 of 2,987 of the 2nd Sino-Japanese War. Day 80 of 124 of the Battle of Henan. Day 35 of 39 of the Battle of Xuzhou. UK: The British government introduces a national conscription policy for all 20 and 21 year old males. UK: The British Air Ministry places an order to buy 524 P-40 Tomahawk fighters from the US. CBI - China: Day 660 of 2,987 of the 2nd Sino-Japanese War. Day 42 of 54 of the Battle of Nanchang. Day 8 of 35 of the Battle of Suizao. ETO - Norway: Day 19 of 63 of the Battle of Norway. After holding off German attacks at Kjorem, the British 15th Brigade withdraws to form a new line at Otta. Meanwhile, the German 196th Division captures the Østerdal valley. Germany: Himmler signs the order to begin construction of the Auschwitz concentration camp at Oswiecim, Poland. CBI - China: Day 1,026 of 2,987 of the 2nd Sino-Japanese War. Day 165 of 381 of the Battle of South Guangxi. Atlantic: German sub U-110 sinks the British ship HENRI MORY 300 miles west of Ireland. U-552 sinks the British trawler COMMANDER HORTON 80 miles south of Iceland. U-147 sinks the Norwegian ship RIMFAKSE and the British ship BEACON GRANGE 100 miles southwest of the Faroe Islands. ETO - UK: Day 234 of 258 of the Blitz. MTO - Greece: Day 22 of 25 of the Battle of Greece. The German 2nd Panzer Division captures Athens. The Luftwaffe sinks the Dutch passenger liner SLAMAT and the destroyers HMS DIAMOND and HMS WRYNECK shortly after they leave Nauplia in southern Greece with evacuated troops. MTO - Libya: Day 18 of 256 of the Siege of Tobruk. The Luftwaffe destroys 4 anti-aircraft guns. Afterward, the British move their other AA guns to concealed positions and place dummy guns in the old spots. East Africa: Day 322 of 537 of Italy's East African campaign in the lands south of Egypt. CBI - China: Day 1,391 of 2,987 of the 2nd Sino-Japanese War. CBI - Thailand: Day 209 of 221 of the Franco-Thai War (Vichy France vs Thailand). USA: FDR addresses the nation of the need for increased taxes, wage and price controls, gasoline rationing, and rationing of other strategic materials. Atlantic: Day 104 of 169 of Germany's Second "Happy Time," during which U-boats sink 609 Allied ships with little risk. ETO - UK: The Luftwaffe bombs Norwich. ETO - Germany: For the fourth night in a row, the RAF bombs Rostock. Germany: The first of 127 Polish female political prisoners arrives at Auschwitz Concentration Camp. Russian Front - North: Day 232 of 872 of the Siege of Leningrad. Russian Front - North: Day 79 of 102 of the Battle of the Demyansk Pocket, another failed attempt to break the siege at Leningrad. Russian Front - North: Day 95 of 103 of the Battle of the Kholm Pocket. Another attempt to break the siege at Leningrad. Russian Front - South: Day 180 of 248 of the Siege of Sevastopol, Crimean Peninsula. CBI - Burma: Day 135 of 164 of Japan's Invasion of Burma. CBI - China: Day 1,756 of 2,987 of the 2nd Sino-Japanese War. A major mining disaster in Manchukuo results in the death of 1,527 miners. PTO - Malaya: Day 68 of 357 of the Battle of Timor Island. PTO - Philippines: Day 141 of 152 of the 1st Battle of the Philippines. ETO - UK: The British begin using their new radar jamming devices in eastern England. Germany: The German Inspector of Concentration Camps issues orders saying that only mentally ill prisoners will be gassed via the Aktion T-4 Euthanasia Program. Russian Front - North: Day 597 of 872 of the Siege of Leningrad. Russian Front - North: Day 358 of 658 of the Siege of the Kholm Pocket. MTO - Tunisia: Day 162 of 178 of the Battle of Tunisia. RAF and US Air Forces provide Allied air support. Heavy fighting continues at Enfidaville. The Victoria Cross is posthumously awarded to Captain Lord Charles Lyell, killed while knocking out an 88mm gun position and two machine gun posts. Day 1 of 5 of the Battle of Hill 609. CBI - Burma: Day 79 of 79 of the Allied Operation LONGCLOTH. US 10th Air Force provides air support. A unit of Chindits crosses the Chindwin River with help from men of the Gurkha Rifles. CBI - China: Day 2,121 of 2,987 of the 2nd Sino-Japanese War. PTO - Alaska: Day 325 of 435 of the Battle of Kiska, Aleutian Islands. US 11th Air Force attacks the Main Camp on Kiska Island. PTO - Japan: The USS SCORPION sinks the merchant ship YUZAN MARU. PTO - Solomon Islands: US 13th Air Force B-24s pound Vila and the airfield on Ballale Island while B-17s hit Kahili Airfield. PTO - New Guinea: Day 6 of 148 of the 2nd Battle of Lae-Salamaua. 5th Air Force provides air support. UK: Both the Canadian and New Zealand Prime Ministers arrive in London for the British Commonwealth Prime Ministers' Conference, aka the Imperial Conference. Atlantic: German planes spot an Allied convoy west of Start Point along the Channel Coast, which is a practice run for the upcoming D-Day invasion. That night, small German gun boats attack the convoy, killing hundreds. ETO: US 8th Air Force B-17s and B-24s bomb V-weapon sites and other targets in France and Belgium. ETO: US 9th Air Force B-26s, A-20s, P-47 and P-51s attack coastal targets in France and Belgium. Russian Front - North: Day 86 of 191 of the Battle of the Narva Isthmus, Estonia. Both German and Soviet troops remain in their defensive positions. Russian Front - South: Day 20 of 35 of the Battle of the Crimea. Russian Front - South: Day 20 of 60 of the Battle of Romania, 1st Jassy Offensive. MTO - Italy: Day 102 of 123 of the Battle of Monte Cassino. RAF and US Air Forces provide air support. The German Gustav Line continues getting weaker. MTO - Italy: Day 97 of 136 of the Battle of Anzio. RAF and US Air Forces provide air support. CBI - Burma: Day 54 of 166 of the UK's Operation THURSDAY. CBI - Burma: Day 49 of 147 of the Battle of Myitkyina. US 10th Air Force provides air support. Merrill's Marauders begin an advance on Myitkyina. CBI - Burma: Day 27 of 302 of the Chinese Salween Offensive. US 14th Air Force provides air support. CBI - China: Day 2,487 of 2,987 of the 2nd Sino-Japanese War. Day 11 of 259 of Japan's Operation ICHI-GO. Day 11 of 39 of the Battle of Central Henan, the first offensive in Japan's Operation ICHI-GO. CBI - India: Day 51 of 118 of the Battle of Imphal-Kohima. Anglo-Indian troops attempt an attack on the far side of a tennis court at Kohima. PTO: US 7th Air Force: B-24s night bomb Truk Atoll, Caroline Islands. During the day, B-25s attack on Ponape Island and the Jaluit, Wotje and Mille Atolls in the Marshall Islands. PTO - New Guinea: Day 59 of 80 of the Battle of the Admiralty Islands. 5th Air Force provides air support. PTO - New Guinea: Day 135 of 597 of the Battle of New Britain. US 13th Air Force provides air support. PTO - New Guinea: Day 6 of 481 of the Battle of Western New Guinea. The US Army completes their capture of the Hollandia airfields and isolates 200,000 Japanese troops for the duration of war. PTO - Solomon Islands: Day 179 of 295 of the Battle of the Bougainville Islands. US 13th Air Force provides air support. MTO - Italy: Anti-fascist Italian partisans capture Benito "Il Duce" Mussolini, his mistress Clara Petacci and 12 of his cabinet members as they attempt to slip into neutral Switzerland and board a plane to Spain. Tomorrow they will be executed and their bodies will be transported by truck to Milan, hung upside down and displayed publicly for revilement by the masses. News of this will fill Hitler with the resolve not to allow a similar gruesome end to befall him. 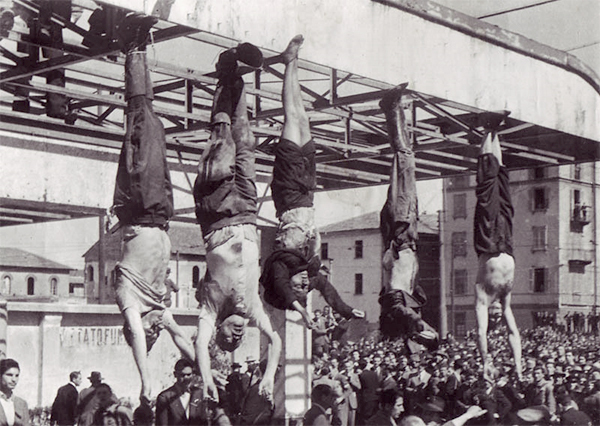 Benito Mussolini (second from left) and his mistress (third from left) and various cabinet members hang upside down from an Esso gas station in Milan's Piazzale Loreto, the scene where Mussolini's own fascists executed fifteen partisans the previous year. UK: So far the number of casualties from V-2 rockets hitting England are at 2,754 civilians killed and 6,523 seriously injured. ETO - France: Day 272 of 284 of the Battle of Brittany. ETO - France: Day 225 of 236 of the Siege of Dunkirk. ETO - Germany: The US 1st Army captures Kempten and Straubing in southern Germany (Bavaria). Russian Front - Center: Day 195 of 206 of the Battle of the Courland Pocket in Latvia. Russian Front - Center: Day 12 of 23 of the Battle of Settin-Rostock, both sides of the border between Germany and Poland. Day 6 of the 11-day Battle of Bautzen. Russian Front - Center: Day 12 of 17 of the Battle of Berlin. The German 9th and 20th Armies attempt to relieve Berlin, but both are blocked. Russian Front - Center: Day 74 of 83 of the German Siege of Breslau (today Wroclaw, Poland). The Soviets continue with their siege. Russian Front - Center: Day 4 of 8 of the Battle of Halbe, Germany. MTO - Italy: Day 22 of 27 of Operation GRAPESHOT. US 5th Army captures Genoa. The Allied Air Forces provide air support. CBI - Burma: Day 83 of 99 of the Battle of Pakokku and Irrawaddy River operations in central Burma. The Indian 17th Division holds off a suicide charge near Pegu. CBI - Burma: Day 3 of 12 of the Battle of Rangoon. US 10th Air Force provides air support. The British East Indies Fleet arrives from Ceylon to begin strikes for the capture of Rangoon. CBI - China: Day 2,852 of 2,987 of the 2nd Sino-Japanese War. Day 27 of 91 of the Battle of Zhijiang. US 14th Air Force provides air support. Day 19 of 60 of the Battle of West Hunan (near Zhijiang). PTO - Alaska: US 11th Air Force B-24s drop fragmentation bombs on the Kataoka naval base at Shimushu Island. PTO - Caroline Islands: US 7th Air Force B-24s bomb Woleai Atoll. PTO - Japan: US 20th Air Force B-29s bomb airfields at Izumi, Miyazaki, Kokubu, Miyakonojo, Kanoya and Kushira. PTO - Japan: Day 27 of 83 of the Battle of Okinawa. PTO - New Guinea: Day 487 of 597 of the Battle of New Britain. US 10th Air Force provides air support. PTO - New Guinea: Day 371 of 481 of the Battle of Western New Guinea. US 10th Air Force provides air support. PTO - Philippines: Day 191 of 299 of the 2nd Battle of the Philippines, aka the Liberation of the Philippines or the Philippines Campaign. PTO - Philippines: Day 134 of 244 of the Battle of Luzon. 5th Air Force provides air support. PTO - Philippines: Day 49 of 159 of the Battle of Mindanao Island. 5th Air Force provides air support. PTO - Philippines: Day 41 of 135 of the Battle of the Visayas region. US 5th and 7th Air Forces provide air support.